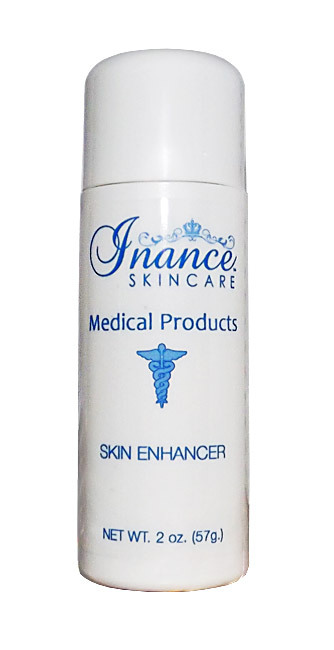 Inance Skin Enhancer is indicated for the correction of unwanted pigmentation such as age spots, liver spots, freckles, and other unwanted areas of excess melanin or hyper pigmentation. For external use only. Avoid direct contact with the eyes. Limit sun exposure and utilize a sunblocking agent when using this product to prevent repigmentation. Keep out of the reach of children. Apply a thin layer to affected areas twice per day after your Inance Step 2 Toner. Active Ingredient: alpha-Arbutin, Kojic Acid, Rumex Occidentalis, Tocopheryl Acetate, Ascorbic Acid, Lactic Acid. All Ingredients: Deionized Water, Cetyl Alcohol, Glycerine, alpha-Arbutin, Kojic Dipalmitate, Sodium Lauryl Sulfate, Trivalin SF, Stearyl Alcohol, Magnesium Ascorbyl Phosphate, Rumex Occidentalis, Tocopheryl Acetate, Ascorbic Acid, Sodium Metabisulfite, Lactic Acid, Edate Disodium, Methylparaben, Propylparaben, BHT Ubiquinone.